Sunday, Nov. 12, 2000 began for me like any other Sunday during the NFL season. 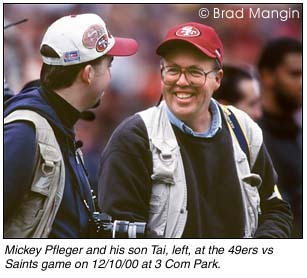 My son, Tai, came by the house in the morning, and we drove to Candlestick Park together to shoot the 49ers/Chiefs game. We usually arrive at the stadium by 10:30 or 11:00 a.m. and unpack our photo equipment in the 3rd base dugout at the Stick. The rest of the morning is spent visiting with the other photographers. The light was really nice that day for photos, but I don't remember shooting any particularly exciting action photographs that day. I have always taken pride in myself on being aware enough along the sidelines to avoid being hit by the very large football players who sometimes come flying towards the sidelines. But my 25-year string of luck changed profoundly one minute and 50 seconds into the third quarter of the game on November 12th. I remember a play coming toward me rather quickly along the southwest sideline. I remember standing up and starting to move backward to get out of the way, like I always do when a play comes toward me. That's the last thing I remember until I came to and realize that I am laying on my back looking at paramedics and doctors. I remember seeing my son, Tai, next to me, and I remember the first words I said to him, "Are my cameras OK?" I slowly began to figure out that I got knocked out by a football player. 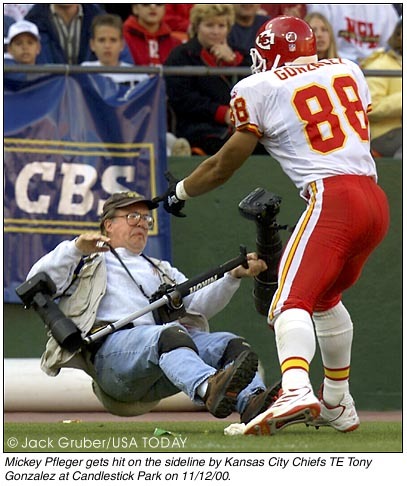 I didn't know at the time that it was Tony Gonzalez of the Chiefs who hit me. 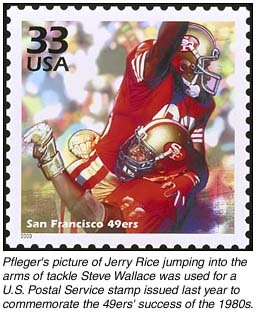 I remember being loaded onto a stretcher and being pushed around the south endzone of the stadium. As I was passing the goal posts, I remember Kirk Reynolds, 49ers' PR director, who was at my side as I was taken to an awaiting ambulance, say to me, "Mickey, can you raise your hand?" I said, "What?" He replied, "They want to know that you are OK."
I didn't really know what was going on, but I did raise my hand. Then I heard a really loud applause come from the fans at Candlestick. I said to Kirk, "That's not for me?" And Kirk said, "Yes, it sure is!" That is something I will always remember and I can see now what a special feeling it must be for professional athletes to have a large stadium full of people cheering for them. I was taken by ambulance to the San Francisco General Hospital emergency room, with my son at my side. I heard the paramedics talking to the emergency room in preparation for my arrival there. At that time, I learned that I was unconscious for two minutes and while unconscious, I went into a seizure. The paramedics got me to San Francisco General Hospital in two minutes. The emergency room at SF General was an extremely busy place, as it always is. I was looked at by many doctors who came in and out of the examination room. I was starting to feel pretty good at that time and it seemed likely that I was going to be released from the hospital very soon. But, one of the doctors remembered that the 49ers team doctor, Dr. James Klint, had told the paramedics to tell the emergency room doctors to be sure to order a CT scan of my brain, since I experienced a seizure while I was unconscious. The results of the CT scan were inconclusive, but did show something in my brain that they were concerned about. I was then admitted to the hospital and a MRI was scheduled for the next day. While I was in the emergency room, a phone call came into the room, which my son took. It was from Denise White, who is the sister of Tony Gonzalez. She told my son that Tony had been calling her from the stadium and from the Chiefs team plane asking her to check on my condition. She said that Tony was very shook after the incident and very concerned about my condition. She said that he stayed with me after I went down, called for help, and didn't want to return to the game until he knew I was OK. But the officials pulled Tony away and told him he had to go back to the game. When I arrived home the following day, there was a large pot of flowers from Tony Gonzalez at my home with a wonderful note from Tony apologizing for the "hit" and wishing me a speedy recovery. Two days later, a football arrived from Tony with another note of concern written on the ball. While in the emergency room, Terry Schmitt came by to visit me. I remember something that Terry told me that, at the time, I didn't know what it meant. But it became perfectly clear as the days and weeks passed. Terry said to me, "Mickey, you are going to find out something from what happened today that has nothing to do with being knocked out on the sideline." I don't know how Terry got that information, but the next day, after my MRI, I knew what Terry was talking about. Dr. Holland, Chief of Neurosurgery, came to my room and told me that the MRI showed that I had a large brain tumor. I was in shock for a while, finding it hard to believe that it could be true. I had no symptoms of any sort of problems and I never get headaches. I was released from the hospital that afternoon and I scheduled a follow-up appointment with Dr. Holland in three weeks to discuss my options as to treatment of the tumor. My son, Tai, picked me up at the hospital to take me home. I told him that I had a brain tumor. We hugged each other, we cried, and he drove me home. The first few days home were very difficult, as I tried to deal with the fact that I had a brain tumor. As the word spread about the brain tumor, the media started to contact Kirk Reynolds of the 49ers, asking if he could put them in contact with me for interviews. Kirk phoned me to ask me if I was interested in talking with anyone. My initial reaction was that I did not want to talk about it. I told Kirk that I was just a quiet photographer who liked to take pictures and stay in the background. But, some of the media figured out how to reach me at home, and after a few days, I was beginning to accept the fact that I had a brain tumor and I felt I was ready to talk about it. I believe I did about three or four TV interviews the first week after the "event" and one or two newspaper interviews. I found that it was really helpful for me to talk about my brain tumor and it was very helpful for me in accepting it and beginning to deal with it. I was also beginning to experience very positive gifts in my outlook on life. After accepting the fact that I had a brain tumor and that I did not know how long I would live, I was able to really appreciate life and live in the present moment. I was determined to live each day to the fullest. It was also very easy to see the things in my life, which were a drain of my energy or which was a waste of time. I also wanted to spend as much time as possible with my family and friends. I knew it would be very difficult to say that I was too busy to do something. I did not want to put off doing anything that was important or enjoyable. During the initial weeks after Nov. 12th, I began to gather as much information as possible about brain tumors. Dr. Holland spends hours with me in his office explaining brain tumors and my situation in particular. I received an e-mail from Darr Beiser, a USA Today photographer, who put me in touch with his wife, Margo Warren, who works for the National Institute of Health in Washington, D.C. She put in touch with a co-worker there who provided me with an incredible amount of information on brain tumors and directed me to other sources of information. I also received several phone calls from people who have had brain tumors themselves and they shared information with me about their particular situation and the method of treatment they chose. Others shared information about family members who have had brain tumors and many names of doctors were shared with me if I wanted to seek other medical opinions. 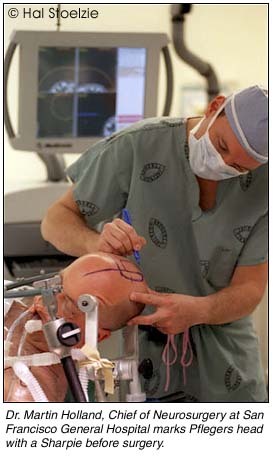 I developed a very close relationship with my neurosurgeon, Dr. Martin Holland, of San Francisco General. I knew that I wanted to stay with him and have him treat me. He has been everything a person could ever want in a doctor. He explained everything to me and answered every question I asked him. We also developed a friendship outside of the medical area. I found out that Dr. Holland has a serious interest in photography (along with his wife who is a cardiologist at Kaiser). I asked him if he would be interested in photographing a 49ers game along the sidelines. His eyes lit up and he accepted my offer of a credential for the December 17th 49er game against the Chicago Bears. I only had one request of him for that game. I told him: "Please don't get hit by a player. You are my neurosurgeon and I don't want anything to happen to you." After several months of research on brain tumors, I made a decision that the next step for me was to have a biopsy done to confirm what kind of brain tumor I had and the grade of the tumor. A biopsy was done on February 23rd by Dr. Holland at San Francisco General and the results came back that I have a Grade II Oligodendroglioma. That news was good, it confirmed that I had a low-grade (slow growing) tumor. It also meant that I have probably had the tumor for very long period of time. The size was 3 cm by 3 cm by 5 cm. Dr. Holland presented my specific case to the Tumor Board of specialists at UCSF. The consensus opinion of all of the doctors was that I should have resection of the tumor (surgical removal) followed by radiation and/or chemotherapy as needed. My decision to remove the tumor by surgery was an easy decision to make. I felt that if I wasn't supposed to know that I had a brain tumor, then I would not have ever found out that I had one. And then I would have gone on with my life and either, never had any problems, or someday, I would start having symptoms or experience a seizure or other serious problem. But I did find out that I had a brain tumor and I really believe that things happen for a reason. I was supposed to be knocked out by Tony Gonzalez at the football game. I was supposed to go into a seizure while I was unconscious, so that Dr. Klint of the 49ers would tell the paramedics to tell the emergency room doctors to do a CT brain scan on me. I was supposed to be taken to San Francisco General Hospital and land in the hands of Dr. Martin Holland, an incredibly talented neurosurgeon. 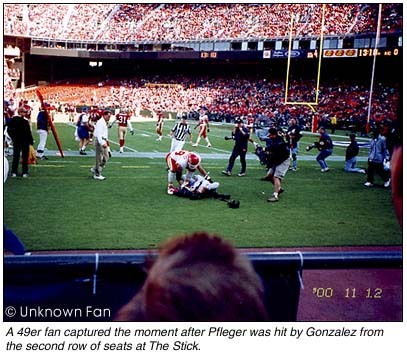 I was never supposed to get hurt from the "hit" by Tony Gonzalez. I couldn't find any bruises on my body the day after being hit full force by Tony, a 249-pound tight end in full football pads. I didn't even have a headache the next day, even though I suffered a concussion and seizure and was unconscious for two minutes. And, none of my camera equipment was damaged in any way, even though my cameras went flying in three different directions. I knew that I could not go on with my life knowing that I had a large brain tumor in my head, no matter how hard I would try to not think about it. So I made my decision to take the offensive against my brain tumor and attack it and have it surgically removed from my brain. Because of the location of my tumor, Dr. Holland told me that after surgery, I would experience paralysis in my left leg for a few weeks. But he added that the function would return over time and with physical therapy, as other parts of my brain would have to take over the functions of the part of my brain which was being removed. Brain surgery was scheduled for May 4th at San Francisco General Hospital. I felt very good about the decision. I knew that I would come out of it in good condition. I felt very safe and very confident with Dr. Holland as my surgeon. I also invited my very best friend, Hal Stoelzle, an incredible photographer, who is on the staff of the Rocky Mountain News, to take photographs during my surgery. Several weeks before the surgery, I was talking with Hal on the phone, and suddenly I decided to ask Hal if he would be interested in coming out to San Francisco to take photographs during my brain surgery. His reply was, "I would be honored to." It was really wonderful knowing that Hal was in the operating room with me, even though I was not awake. Hal also was invited and came out to take photographs during the birth of my son, Tai, 22 years ago. The birth also took place at San Francisco General Hospital. I knew that Hal was supposed to be there and I also knew that my surgery was supposed to take place at San Francisco General Hospital. 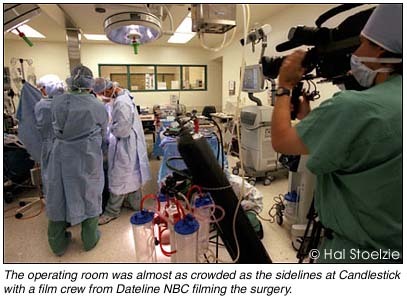 The NBC show Dateline was also present at my surgery and have been following me around since last November, when everything began. Bob Calo, a Dateline producer lives in the Bay Area and contacted me last November to asked me if he could meet with me to discuss doing a story about me and the unusual series of events which have occurred form the very beginning and follow me through to the end. I really liked him and agreed to do thestory. Participating in the story has been very helpful to me in being able to express my feelings into words about what has happened to my life and the process of reaching a decision to remove the tumor. I have been a photojournalist my entire life and have always been the one who has entered into someone,s life to photograph them for a particular story. It felt very different to be the one someone else is doing a story on. But it has been an incredible and valuable experience for me to let NBC Dateline enter into my life. On May 4th at 6:30 a.m., my son Tai and his wife Ora, my brother Larry (from Minnesota), Hal and I, drove to San Francisco General Hospital. I was checked in and was taken to the surgery preparation room. Hal got his surgical scrubs on in preparation to take pictures in the operating room, and my family went to the waiting room. The wait to go to the operating room seemed to be taking a long time. I overheard some nurses say that there were several trauma cases coming into the emergency room and then Dr. Holland said there may be some delays because of many emergencies that were coming into SF General. I found out later from Dr. Holland that he almost had to cancel my surgery for that day because the hospital was running out of beds. But, my luck continued to follow me and I was put to sleep and taken into the operating room. The next thing I remember was waking up and seeing Dr. Holland with a big grin on his face. I immediately knew that I was OK, even before he told me that surgery went well. He said that he was able to remove over 90% of my brain tumor and that there was only a small piece remaining. He could not remove it because it was located in the primary cortex area and that if that area of the brain was disturbed, I would have a permanent paralysis for the body part which that part of the brain controls. The surgery took 2 hours and 45 minutes. I was then taken to the recovery room where I was reunited with my son and his wife, my brother, my ex-wife (who has been really supportive and helpful), and Hal. I was supposed to be taken to the Intensive Care Unit for the next two days, but it was full from the many traumas that had come to San Francisco General that day. So I spent the night in the recovery room. I think I had the place to myself by nighttime, except for maybe one other person. The next morning I was transferred to a private room in the hospital. My left leg was paralyzed, as expected. But my left arm and left hand were also about 80% paralyzed, which was not expected. When Dr. Holland visited me after surgery, he was very pleased that I could wiggle my toes on my left leg and that I had all feeling to touch in my left leg. He said that I was two weeks ahead of schedule of where he thought I would be regarding the temporary paralysis. Function slowly began to return immediately, with function in my left arm and hand coming faster than my leg. I began physical therapy the next day and I was given a wheel chair to cruise around the hospital. I would push it by using my right foot on the ground and using my right hand on the wheel. On Monday after surgery, I made a surprise visit to Dr. Holland in his office at SF General. He was pleased with my rapid progress. On May 9th, I was transferred to a rehab hospital in San Jose and was there for two days. I had to be transferred to another rehab hospital on May 10th, due to an insurance problem. I got a ride by ambulance to St. Mary,s Hospital in San Francisco, which is where I stayed until I was released home on May 18th. At St. Mary's Hospital, I had daily sessions of physical therapy, occupational therapy, and speech therapy. One day, I remember going to the physical therapy room in a wheel chair and returning to my room walking with a cane. A few days later, I went to physical therapy using a cane to walk and I returned to me room just holding the cane, and not using it. It was really amazing watching new areas of my brain learn to take over functions such as walking which were previously done by the part of my brain which was removed because of the tumor. I gained a very deep appreciation of simple things that we all take for granted such as walking or just being able to take a step with your foot, or step up a stairway, or even pick up an object with your fingers. Now that I am home, I still have physical therapy treatments in my home three days a week, which are helping me regain all of my functions more rapidly. My left arm and hand are close to 100% and getting better and better every day. Probably my greatest concern with the brain surgery was that I did not want to come out of surgery with some sort of deficit in my ability to think or reason. I did not want to be disoriented or confused. 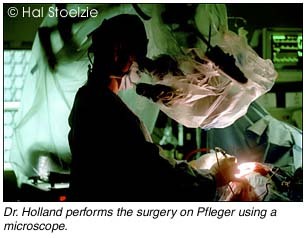 Dr. Holland assured me that there was virtually no chance of that happening because of the location of my tumor. Dr. Holland was again right on with his prognosis. One night, about 5 nights after surgery, while lying in my hospital bed, I had an incredible feeling, which is very hard to put into words. I knew, at that time, that my mind was working fine and that everything was very clear. I was also getting many creative ideas. I don't remember a time in my life where my thoughts were so clear and precise. I was also given some really exciting visions into the future that I will be very excited to see if they come true. I really believe that they will. I have received a tremendous amount of support and prayers from my many friends. I am so very fortunate to have such wonderful friends. THANKS! I really appreciate it. I also really appreciate the tremendous support I have received from the San Francisco 49ers organization and Kirk Reynolds, who went out of their way to take care of me on Nov. 12th. Coach Steve Mariucci has been great and has phoned me many time to see how I am doing. Tony Gonzalez and his sister, Denise White have been wonderful and I am thankful that we have become very close friends. But I have also received tremendous support from people I don't know who were praying for me and wishing me well. 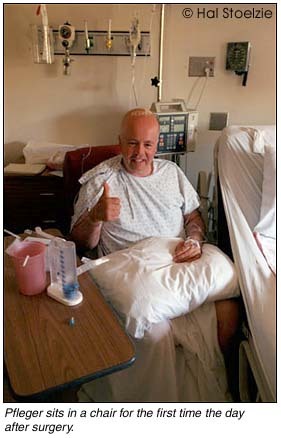 I know all of that support, along with the positive attitude that I tried to keep, and with the medical expertise of my neurosurgeon, Dr. Holland, and his medical support team of doctors and nurses, made my experience with the discovery of my brain tumor and subsequent surgery to remove it, a tremendous experience. It has been positive in all aspects. I thank God that I am alive and I am looking forward to the future. I feel great! I feel like a new person and I feel that I am just beginning life for the first time. I have to say that I am the luckiest person in the world! I will have to continue to have follow-up MRIs to check the remaining tumor which could not be removed. I will have my next MRI in three months. And I do have to begin research on radiation and chemotherapy since those treatments are being recommended for me to consider. But right now, I feel GREAT, and I will not be doing any medical treatments other than monitoring what's left of my tumor. I will be taking one day at a time! 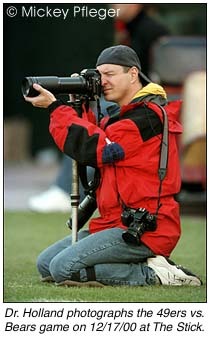 And I will be looking forward to continuing to take photographs since that is what I am - a photographer/sports shooter!